Visit the Fluence stand at hall A2, booth 205 to meet our experts who’ll share onsite demos of our efficient, effective and highly sustainable solutions. Fluence will showcase our latest solutions in water, wastewater and waste-to-energy. Fluence’s advanced MABR (Membrane Aerated Biofilm Reactor) wastewater treatment technologies combine nitrification and denitrification to simultaneously treat nitrogen and phosphorus, with energy consumption of up to 90 percent less than with traditional treatment methods. Fluence MABR uses passive aeration, the diffusion of oxygen through membranes. Packed in compact containerised systems, it provides efficient on-site treatment that meets the strictest discharge regulations. At IFAT, Fluence will display its new smart packaged wastewater treatment solution based on the innovative MABR technology. To guarantee the long-term sustainability of resources, Fluence offers innovative waste-to-energy solutions that treat wastewater and produce energy. Fluence provides a variety of industries with cost-effective closed-loop solutions to dispose of difficult wastewater and sludge while producing renewable energy. At booth 205, you’ll see how Fluence applies its anaerobic digestion solutions to a variety of industries, including dairy farms, meat processing plants, and paper companies, as well as the new advanced anaerobic reactor configuration that makes the most of renewable energy production, while producing a high-quality effluent. With its NIROBOX line, Fluence offers the most compact water treatment solutions, that allow decentralised desalination systems to be deployed to supply local populations and industries with high quality water at a viable cost. Unlike large-scale desalination plants, Nirobox containerised units offer a fast ‘time-to-water’ and can be deployed in months, rather than years. This opens new opportunities to immediately address water shortages and needs. With seawater and brackish water desalination models, as well as a freshwater treatment model, the Nirobox line of products can provide a suitable solution to your needs. We look forward to seeing you at hall A2, booth 205. 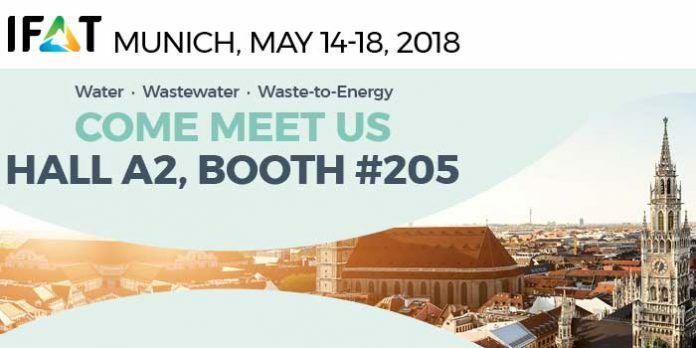 For the most up-to-date information about IFAT and Fluence, be sure to visit: www.fluencecorp.com/ifat-2018.